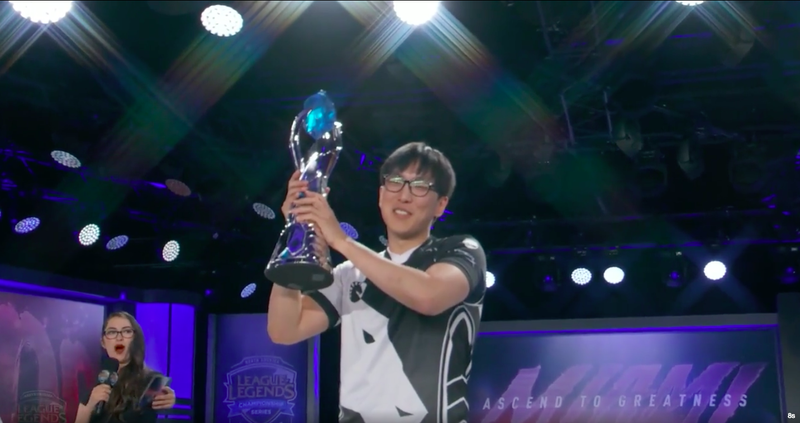 Three different teams with Yiliang “Doublelift” Peng on them have now won major North American League of Legends titles. The third, Team Liquid, instantly became the most memorable last night with a 3-0 sweep over 100 Thieves. Just a week after his brother was arrested and charged with murdering their mother, Doublelift opted to travel to Miami and compete in the North American Spring Split. 2017 was not a good year for Team Liquid, with two consecutive ninth-place finishes in North American splits, and the team massively rebuilt at the end of the year. Their opponents in the final, 100 Thieves, were looking to cap what has been a breakout first season in the league under owner Nadeshot and coach Neil “pr0lly” Hammad, both longtime esports fixtures. The first game between these two teams was close, and while 100 Thieves gained a slight lead, Liquid never fell far behind. When the Thieves went to take Baron after a quick pick, Liquid’s remaining members set up and Jake “Xmithie” Puchero executed a beautiful steal, taking away the buff and equalizing the playing field. In the second match, mid lane player Eugene “Pobelter” Park shone. His Azir is always solid, but one particular “shuffle” in the Baron pit resulted in catastrophe for 100 Thieves. By the time Liquid was knocking down the door of 100 Thieves’ base in game 3, the result seemed clear. If it wasn’t Park popping off, it was Peng, or Jung “Impact” Eon-yeong, or Puchero, or even Kim “Olleh” Joo-sung on support. 100 Thieves didn’t make it easy, but the entire finals felt very tempo-heavy, and once it shifted in Liquid’s favor, it was a slow snowball to victory.